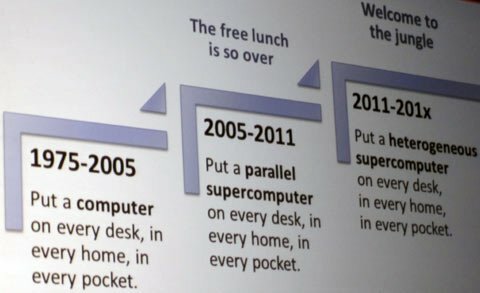 Legit Reviews reports Microsoft has big plans to put a heterogeneous supercomputer on every desk, in every home and in every pocket. Microsoft kicked off the second day of the AMD Fusion Developer Summit with a great keynote presentation by Herb Sutter that started off describing how heterogeneous computing is coming and it's going to apply to any device that we use for computing. He also stated that mainstream media outlets like to talk about three things these days and those happen to be multicore CPUs, GPGPU and cloud Iaas/HaaS. Microsoft doesn't see these hot topics as three different trends, but rather a single trend towards heterogeneous processors.